Arrived 2 days early for a group tour of Buenos Aires and Patagonia. Contacted Buenos Tours about a 7 hour walking tour that would see different areas of the city than the group tour we would be joining the next day. Quick Email response back and forth and easy arrangements were made for a unique day of touring with Jack. He provided a lot of historical and cultural information. Arranged visits to artisan shops (wife is a fiber artist) we would not have otherwise known about. 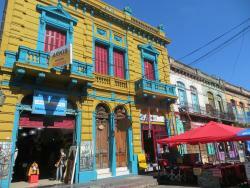 Visited a couple of barrios we would not have likely gone to on our own. Very pleased with the overall experience and would highly recommend this company! After doing a lot of research and reading many recommendations we decided to spend our day in Buenos Aires by doing a 7 hour Private Walking Tour offered by BuenosTours. Right from the start we had the feeling to be in good hands. After finalizing the reservation, we got a questionnaire from the tour company about our special interests and what we wanted to see in Buenos Aires. A short while later we received the CV of our assigned tour guide Ceri including a picture and detailed instructions where to meet him. 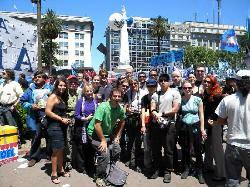 Our guide Ceri met us on time at 10:00 am right at the entrance of the port of Buenos Aires. By the way his English was perfect, because he grew up in Canada. He took us to many different places of the city: i.e. 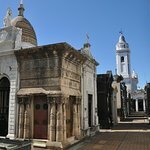 San Telmo centered around Plaza Dorrego, the historical city center of Monserrat, the Cafe Tortoni, Retiro - Plaza San Martin and finally Recoleta Cemetery. Ceri has a very deep knowledge about Buenos Aires but even more about the Recoleta Cemetery. He is writing a book about the history of the cemetery and the hidden symbols and stories of the tombs. We had lunch at a traditional Argentine restaurant with great meet from the grill, a place where you find only a few tourists but many people from the city. We enjoyed every minute of his tour. 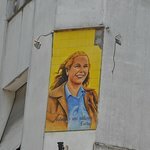 Thank you Ceri for the unforgettable experience in the city of Evita. 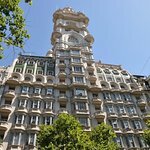 I had been to Buenos Aires a few times in the past, but as this was my son's first visit I decided to book the seven hour walking tour to get a proper insight into the city and its people. Booking over the web was easy and followed up by an exchange of emails about what we wanted to do. We were quite specific, including the requirement to experience the "best empanadas in BA". We were allocated Ceri as guide and he was tremendous. Personable, interesting and extremely knowledgeable, he delivered exactly what we were looking for including lots of interaction with the locals, places we would never have found on our own, and the empanadas! 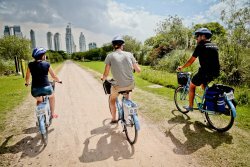 Me and my son loved this experience and can't recommend it highly enough. .
We had one full day in Buenos Aries and Buenos Tours arranged a fantastic tour that was a great introduction to a huge city. The tour was mostly walking, but included 2 taxis and a public bus. If you speak English or Spanish ask for Jessica as she is one of the best guides we ever had. 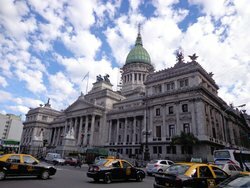 We have chosen BuenosTours for our first day in Buenos Aires to get to see the highlights of the city but also to get helpful insights in how to navigate the city. We were picked up at our hotel (which is great if you are still unsure how to get from A to B in a new city) and our guide Oliver took us to all the great places in the heart of the city. The tour was also a great preparation for us for the other days we spent in the city. Also great to see that BuenosTours is still run in a way to connect with everyone individually.